First of all, each card is printed on to the edge on both sides. A very nice product. People who ordered them last year were impressed at how non-cheaply made the cards were compared to the usual sort of thing they bought out of pity from the half-sane offspring or associates of co-workers. I am contractually obligated to be the first, occasionally only person to say one of my art works is trash, but these cards came out splendidly. If you for some reason want to buy some, you may communicate with me via email, ([email protected]), or the note system, or in skype (yirzod) or whatever-else-have-you that also have-I. Please say which cards you want and how many of each. 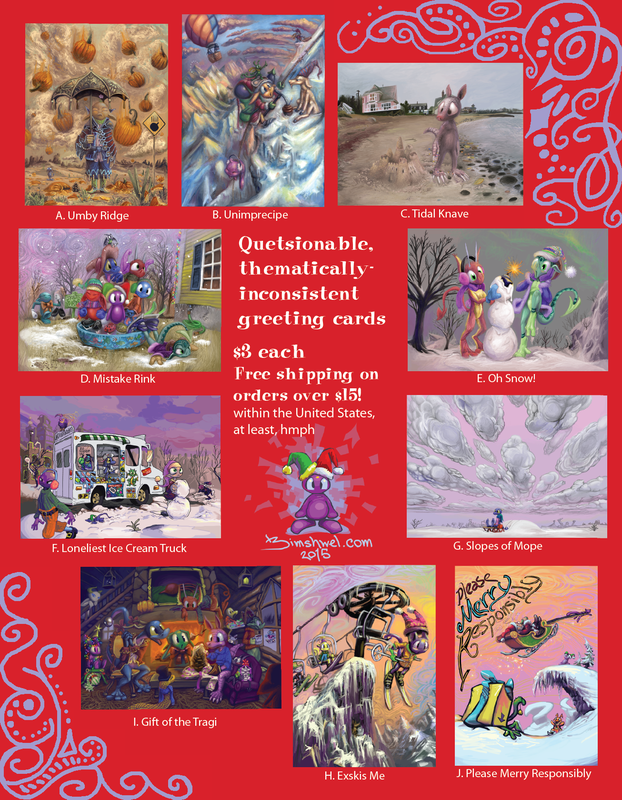 Timeframe: After the Thank-giving holiday, I will place my own order with the print joint and retrieve the cards. Therefore you would probably receive the cards in early December. If you want the cards sooner, I probably cannot accommodate that at this point. However if you want the cards later, that could potentially work very well for you. Shipping specifics: Within the United States it should cost about $2.54 to send most orders, since sense suggests use of a rigid envelope. As I hypothetically would earn a bit over a dollar per card, it is difficult to for me to justify covering that cost for fewer than five cards. And then it looks like an extra $5 to ship out of the country, and hypothetically the “free” conditions would be adjusted accordingly. Nonetheless I WILL ship cards to you in Sevastopol if that becomes necessary. But if by some chance fate you can arrange to meet and receive cards from me or a doppelganger directly, then obviously no outside shipping will need to occur at all. I would probably make more sales if I just said nothing about shipping and let people think they were getting something cheap until they were in too deep to want to back out, like professionals do. Payment: It can be done through check, paypal or other internet payment system (you tell me; I can never remember what they are called). Local deliveries can also be paid for with cash, gold, certain prepared foods or by pulling a gun on me. And if there is another rectangularly shaped picture of mine that you would like on a card instead of any of those, let me know as soon as possible and I will see about formatting it. The facebook post was late, and this is VERY late. I should have posted it sooner than that, but I was not sure if I wanted to. I still am not sure. But two-to-three people have already asked, so I have to go through with it regardless of who else does. My fate is sealed. 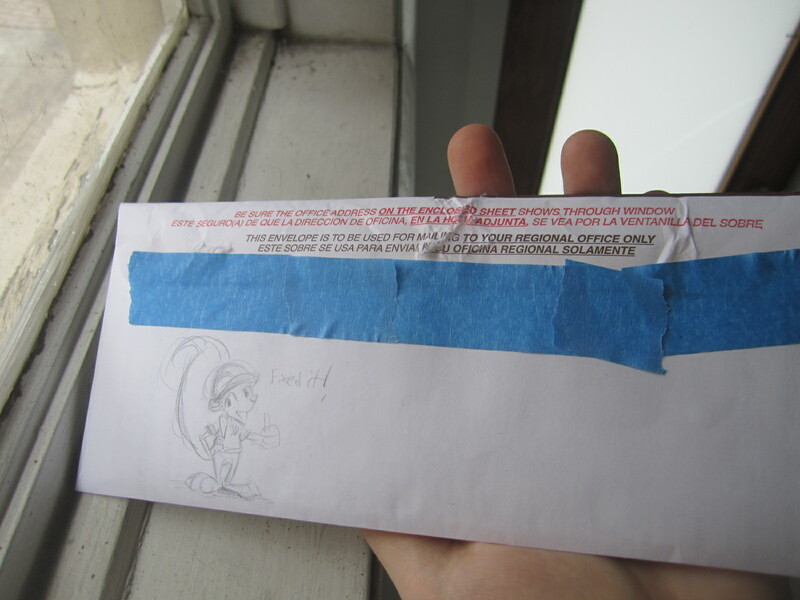 Maybe it is sealed like this, but this actually got delivered, so legally it is permissible. I think the heavy compression actually makes the purple dope look better – or at least more of an adorable blockhead.